Few years back, Mercedes-Benz Canada held one of their Driving Academy courses here in Calgary at Racecity Speedway. Aside from a full day of track training from esteemed instructors, this was a great opportunity to get into a wide range of MB products all in one day, on a track no less—from the surprisingly swift B200 Turbo to the remarkable (and perhaps underrated) E63 AMG sports sedan, with everything in between. The single most prevalent thing I came away with from this was how refined the MB product is. Sure, Mercedes is synonymous with luxury and quality, however, the consistency in the level of refinement across each and every vehicle, despite class or price point, was impressive. Fast track a few years, just wrapping up my one-week test drive with the 2011 Mercedes-Benz GLK350 4Matic, brought me back to that glorious day…refinement is the name of the game, and the 2011 GLK350 4Matic is no exception. The 2011 Mercedes Benz GLK350 is, as the company puts it, a completely original form of Mercedes. 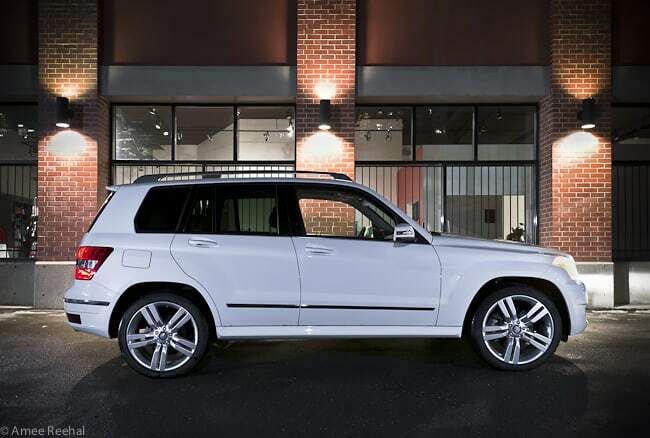 While it is built on the C-class platform, the GLK certainly retains its own personality, especially when compared to its older, wiser, and significantly larger G-class, GL-class, and M-class siblings—distinct personality that also carries with it a $41,300 MSRP CAD starting price-point; more than $15,000 less than the step-up M-class. With the increasing popularity of the compact sport-ute market, jumping into this segment with the luxury GLK, coupled with this enticing starting price, only makes sense for the company. First introduced in North America for the 2010 model year, and now available in a RWD version for 2011, the GLK-class offers the single GLK350 model available in two versions: the GLK350 and the GLK350 4Matic (as per my tester), the latter starting at $43,500 MSRP CAD. Both powered by the same 3.5-litre, 24-valve V6 producing a respectable 268-hp and 258 lb-ft of torque. A seven-speed automatic transmission, dubbed the 7G-Tronic, comes standard. But it’s the 4Matic permanent AWD system, now in its fourth-generation, that really shines. Though I never scaled any mountainous terrain in my luxury media-loaned press GLK, that’s precisely what the 4Matic is for, splitting the engine’s power and torque between all four wheels, providing better traction and stability. Paired to various other features including the Electronic Stability Program (ESP), this system provides even further performance, but more importantly, increased safety on the open road for the Soccer Moms and media-dudes alike. For a mere $2200 extra, you get the 4Matic AWD version, so I’m not clear why anyone would choose the non-4Matic version, or why Mercedes even offers this, seeing as this appears to be only thing that really sets the two apart; everything else is offered with both versions. The exterior styling of the 2011 GLK350 is stunning, void of any round, bubbly attributes that often plague this segment. Instead, a well proportioned ride with strong, clean lines; the long front end adds some beef, while the steep rear truly gives it character (plus, excellent visibility in the corner windows behind the C-pillar)—overall, luxurious yet sporty and masculine. And, of course, refined. Exterior power folding mirrors, aluminum roof rails, a heated windshield washer system, and huge 20-inch alloy rims all come standard. New for 2011 is the AMG Sport Package for an extra $2500, adding a little more aesthetic love to include AMG style wheels at 20-inch; steering wheel shift paddles; active Bi-Xenon headlamps with cornering function; LED daytime running lights and taillights; and headlamp washers. Few notable options include 20-inch 7-spoke (not standard 5-spoke) silver rims; a front spoiler and/or rear roof spoiler; and chrome door handles. The cabin is equally as stunning: comfortable, stylish, and totally intuitive. All controls are within easy reach amongst an overall streamlined design and logical layout. You wouldn’t expect anything less from a Benz, I’m sure (my only beef: the cruise control lever is situated on the steering column much like a turn signal, finding myself activating cruise by mistake, often). Considering the smaller dimensions of the GLK350, the cabin feels spacious—similar to the feel of a full-size CUV with the comfort of a luxury sedan. Real estate around the back seats is fairly decent; seats that find split-folding backrests and a folding centre armrest with a convenient storage spot with a couple cup holders. A pair of 8-way power adjustable heated front seats, Burl Walnut wood trim, and the Thermatic dual-zone automatic climate control all come standard. So does an Audio 20 audio system with a 5-inch screen mounted upper dash, and the totally awesome central COMMAND controller: a large ‘master dial’ ergonomically placed at the end of the driver’s armrest where your hand sits, allowing easy toggling through one of the best (thus, easy to navigate and understand) menu programs I’ve probably used in some time. My GLK350 4Matic came equipped with the $3400 Premium Package upgrade, adding a slew of goodies including a Panoramic sunroof and 3-position front seat memory, to name a just a couple. Also available is the Technology Package at $2200, adding a 6-disc DVD changer; 4GB music register; LINGUATRONIC voice control; the COMMAND APS with hard disc-drive navigation; and media interface that includes USB inputs and an auxiliary input.